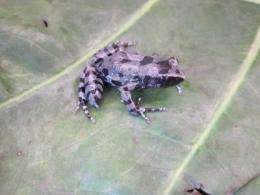 Herpetologists from the California Academy of Sciences and University of Texas at El Paso discovered a single specimen of the Bururi long-fingered frog (Cardioglossa cyaneospila) during a research expedition to Burundi in December 2011. The frog was last seen by scientists in 1949 and was feared to be extinct after decades of turmoil in the tiny East African nation. For biologists studying the evolution and distribution of life in Africa, Burundi sits at an intriguing geographic crossroads since it borders the vast Congo River Basin, the Great Rift Valley, and the world's second largest freshwater lake, Lake Tanganyika. Many of the species in its high-elevation forests may be closely related to plants and animals found in Cameroon's mountains, suggesting that at some point in the past, a cooler climate may have allowed the forests to become contiguous. Previous knowledge of Burundi's wildlife came from scientific surveys conducted in the mid-20th century, when the nation was under Belgian administration. But its history since then has been one of political unrest, population growth, and habitat loss. Today, approximately 10 million people occupy an area the size of Massachusetts, giving Burundi one of the highest population densities in Africa. Academy curator David Blackburn joined his colleague Eli Greenbaum, professor at the University of Texas at El Paso, on the 2011 expedition with the goal of finding Cardioglossa cyaneospila, as well as other amphibians and reptiles first described 60 years ago. To their pleasant surprise, the habitats of the Bururi Forest Reserve in the southwest part of the country were still relatively intact, with populations of rare forest birds and chimpanzees present. With little knowledge to go on except a hunch that C. cyaneospila would make a call like its possible close relatives in Cameroon, Blackburn finally found a single specimen on his fifth night in the forest. "I thought I heard the call and walked toward it, then waited," said Blackburn. "In a tremendous stroke of luck, I casually moved aside some grass and the frog was just sitting there on a log. I heard multiple calls over the next few nights, indicating a healthy population of the species, but I was only able to find this one specimen." The Bururi long-fingered frog is about 1.5 inches long, with a black and bluish-gray coloration. The males are notable for one extra-long finger on each foot, analogous to the "ring finger" in humans, whose purpose is unknown. Its closest relatives live in the mountains of Cameroon, more than 1,400 miles away. The lone specimen collected, which now resides in the Academy's herpetology collection, can be used for DNA studies to determine how long the Cardioglossa species from Burundi and Cameroon have been genetically isolated from one another. The results will shed light on Africa's historical climate conditions, a topic that has far-reaching implications for understanding the evolution of life in the continent that gave rise to our own species. In addition to locating the Bururi long-fingered frog, Blackburn and Greenbaum also documented dozens of other amphibians in Burundi, many of which had never before been recorded in the country. The team also discovered some species that may be new to science. "Eventually, we will use the data from our expedition to update the IUCN conservation assessment for amphibians of Burundi," said Greenbaum. "Because Burundi is poorly explored, we've probably doubled the number of amphibian species known from the country. Once we demonstrate that Burundi contains rare and endemic species, we can work with the local community to make a strong case for preserving their remaining natural habitats." FUN FACT: Ruanda-Urundi split in two separate nations in 1962! Rwanda and Burundi! One of them was home to some of the worst human genocide in recent history! The other is home to this peaceful amphibian!